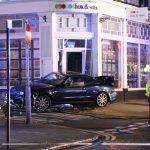 A car drove into pedestrians and a phone box in a busy Brighton street last night (Friday 9 February). Several pedestrians were taken to the Royal Sussex County Hospital in Brighton with minor injuries after the car mounted the pavement in Norfolk Square. The incident happened on the northern Western Road side of Norfolk Square, Brighton, at about 10.40pm. A man was arrested for “driving offences”, Sussex Police said. The force said that it was unable to say how many people were injured. In a statement Sussex Police said: “At 10.40pm on Friday 9 February in Western Road at the junction with Norfolk Square a BMW was involved in a collision with several pedestrians and a telephone box. “Fortunately all pedestrians received minor injuries and were treated at hospital. “A man has been arrested in connection with the incident for driving offences.